I’ll never understand how people can find Brussels sprouts and kale repulsive. They are two of my very favorite vegetables and now I can enjoy them both whenever I want. This is a recipe that I saw in Bon Appetit a few years ago and always meant to try, I’m really regretting waiting this long to make it. I did make some changes to the original recipe by adding some red cabbage for color and crunch and I lightened up the dressing a bit. This is a salad that I will make again and again, I have no doubt. To make it vegan omit the parmesan or replace it with a few tablespoons of nutritional yeast. 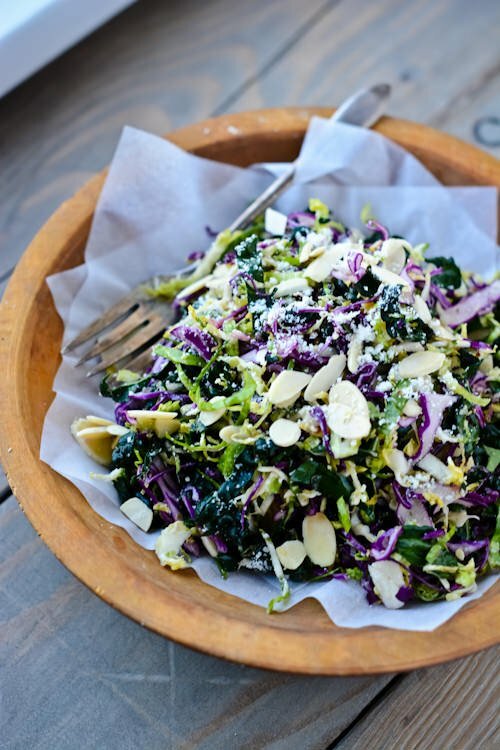 If you aren’t a huge fan of either of these winter staples you should give this salad a try, it might change your life. 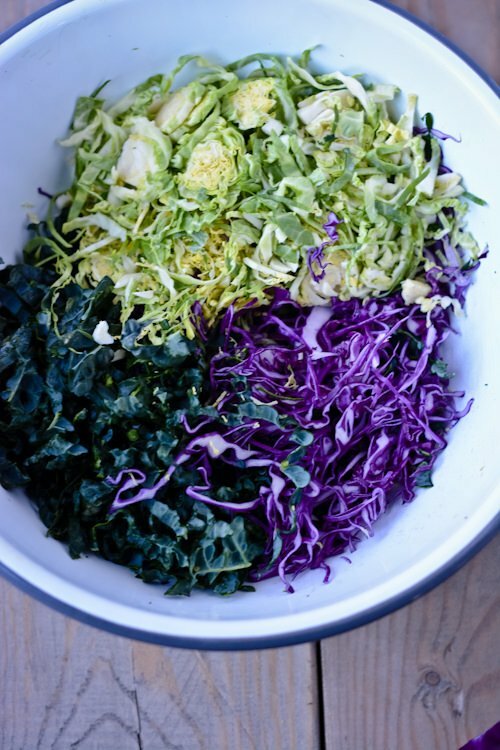 Adapted from Bon Appetit A perfect salad for winter, this salad is loaded with shredded Brussels sprouts, kale and cabbage. 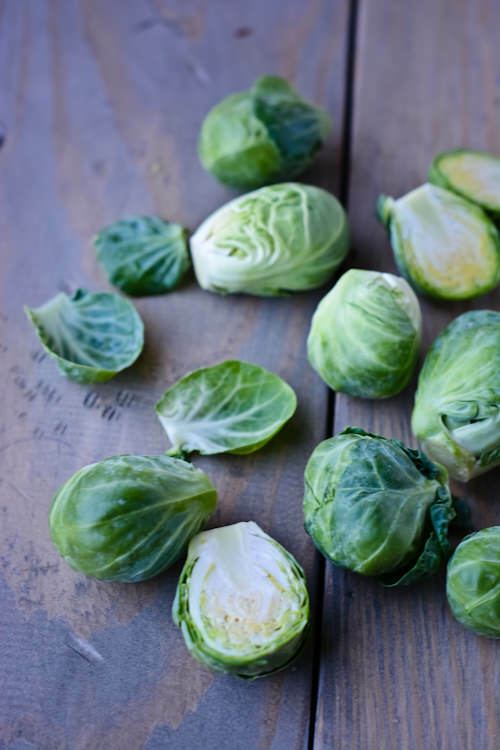 Use a mandoline or a very sharp knife to shred the Brussels sprouts. 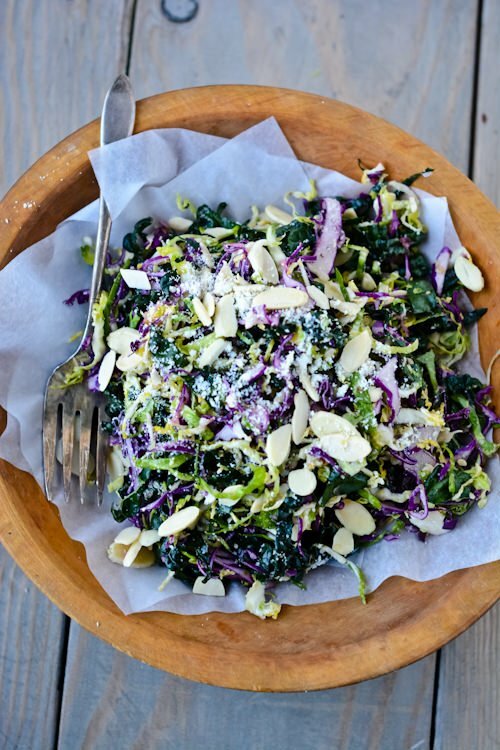 In a large bowl, toss together the shredded kale, brussels sprouts, cabbage and toasted almonds. Add a few tablespoons of dressing and toss well. Taste and add salt and pepper or more dressing if desired. Sprinkle the cheese over the top and serve. Wow! I have been wanting to use my cuisinart more. This recipe sounds delicious and will be so quick and easy if I use the machine. Thanks! I think I would be happy to eat this everyday for the rest of my life. It is everything I like in a salad and best of all you can let it sit for awhile and it still tastes great. I’m having leftovers for dinner tonight! After finding your recipe, I included a link to it in the post :). I’ll be sure to check out the article! I love Brussels sprouts but usually go the roasted route so I’ll have to try it shredded. 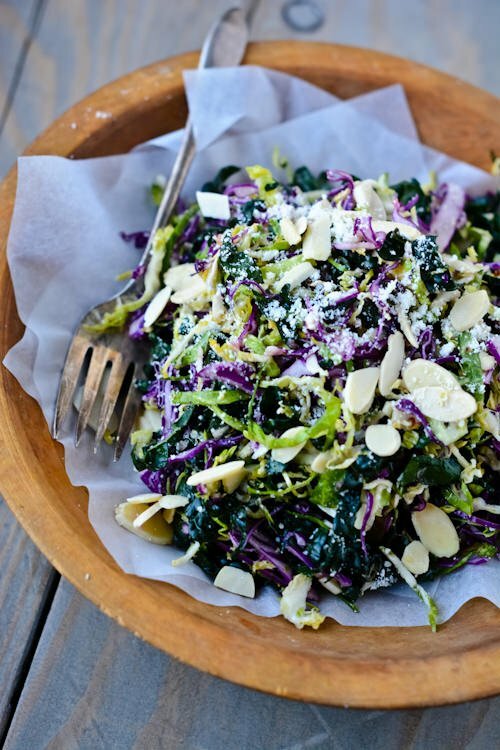 I see how the shredded texture of the greens would be amazing in a salad! So many beautiful winter greens! 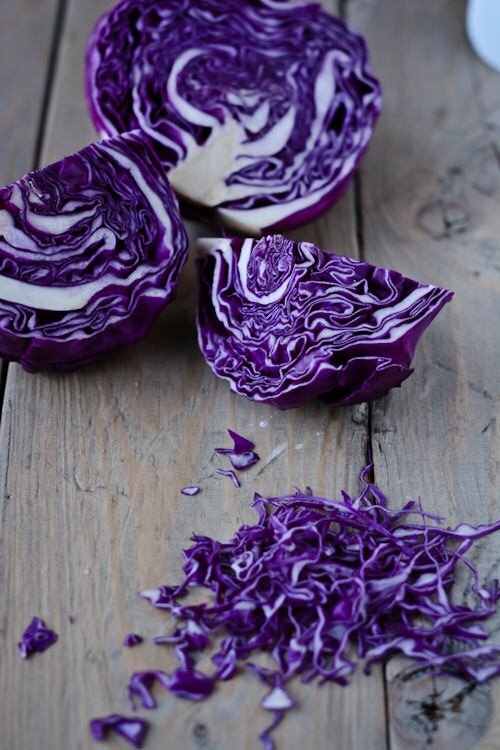 I am definitely on the cabbage and brassica train. I bet this would be amazing wit a fried egg on top! That is a great idea Eileen. I have every intention of making this again so I’ll be sure to add an egg next time. Maybe a soft-boiled one? Your garden in the About page looks lovely! We have a similar backyard and I am wondering what to plant along the slope. Any ideas? I’ve had a lot of luck with Mediterranean and drought tolerant plants. Grasses, lavender and sedums have done really well. It can be pretty tricky but I’d stick to things that don’t need a lot of water. Good luck! This salad looks delicious, I have Hashimotos and was told that these types of vegetables are goitrogenic and if eating they have to be cooked slightly. Would the lemon juice give the same affect as slightly cooking?